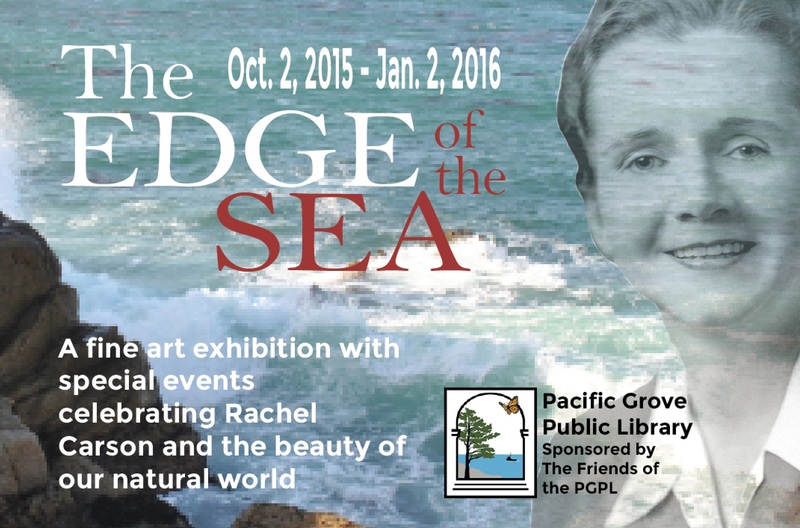 Graphic for The Edge of the Sea event in Pacific Grove. Rachel Carson is a lot of things to a lot of people, though many remember her as a noted environmentalist and author of the book “Silent Spring,” which warned readers of the long term effects of mishandling pesticides. While California’s Monterey Peninsula wasn’t necessarily Carson’s personal playground (she spent most of her time along the east coast), her concerns are mirrored here on the “left” coast. If the lineup for The Edge of the Sea is any indication, Carson’s spirit is alive and well in Pacific Grove. Honoring Carson and her legacy, the Edge of the Sea is an event designed to instill a sense of wonder in the California coast. And it’s going to be quite an event! Starting, and orbiting, an art show at the Pacific Grove Public Library, the event will also feature a wonderful lineup of lecturers such as Stephen Palumbi, Jim Covel, William Souder, Pacific Grove’s Passionfish restaurant co-owner Cynthia Walter, artists Sibyl Johnson, Tom Killion, Christine Crozier, and more. Three Asilomar nature walks will also be held throughout the three month affair. Lecture topics include California’s Wild Edge: Poetry of the Monterey Peninsula with Tom Killion, Pages of Inspiration: Rachel Carson and the Power of the Pen with Jim Covel, History of Hopkins Marine Station with Don Kohrs and much more. On Sunday, November 1st, a Dia De Los Muertos Memorial Paddle Out at Lover’s Point in honor of Rachel Carson and Julia Platt. Local artists Margie Anderson and Julie Heilman will also work on a mural at a local school as part of the event. A number of volunteers became involved in this project and I was happy to be involved in this event as well, volunteering graphic design (let me know what you think of the banner images! ), website production and population, news releases, and lots of time. Others are donated their time as well, be they artists, speakers, and even delivery couriers. Take a moment to check out the site here and we will see you at The Edge of the Sea! Wow. That’s fabulous. Wish I were local. Once upon a not-so-distant past you were! Sad face emoticon. Miss PG. Lots of whales here lately! Is envy a bad thing?